The Ghost Horse. – TALESetc. W e had just finished the roundup, and all of the wranglers collected their pay. Since I was the ramrod of the outfit, I had a lot to say, but when the boys went to town, to spend their money on whisky and women, no one could tell them what to do. Jim and I had planned for weeks, during the roundup, that we would go out on the range, and look for the ghost horse that they said you could only see at night. We left the cantina and got on our saddles for the long ride on the prairie. We had all of our grub in our saddlebags, and we had our parkas behind our saddles. It was getting to be the time of year when it rains and thunders on the prairie. We rode all that night, and slept in the day. We set up camp by a brook so our horses could drink water and hobbled our horses so they could eat the bunch grass, but not run away while we slept. 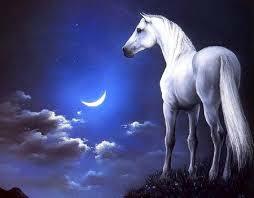 We stayed awake all that night watching for the ghost horse, but we never saw him. We laid our heads on our saddles and went to sleep as the sun warmed us. The next night there was thunder and lightning in the sky. Jim and I, put our parkas on, we knew it would rain at any minute. It was just in time, the rain came down in milk buckets and the skies lit up bright, as the sun had ever made it look but that was just for a second. Then it got pitch black again. “There he is!” yelled Jim. In that split-second of light from the lightning, I saw him too: the ghost horse. Oh! He was beautiful and white but I never got to see him again. Jim and I rode back to the ranch and told everyone about the ghost horse, and that we had seen it. He had a twinkle in his eye. Yes, George got even with us, we will never know!